He was shaking in his scales as the butcher picked him out of the tank of water where he had resided for the last month. Previously he lived amongst the other Salmon on the coast, until one day a net swooped down and caught him along with many of his friends. All that remained of them, after years of living near the bottom of the ocean, was an upsweep of sand that eventually settled into a newborn hill. Leon always knew there was a chance he might get caught, but on the morning of the first cold day in October it gave him shutter when the net dragged him up to the top of the water then threw him along with his buddies into a big hole of an even bigger ship. Each fish weighed at least five pounds and the pressure with one of them on top of the other resulted in the demise of some. Leon felt fortunate to have survived the holocaust and flapped his fins in the glass tank he finally released into. But soon enough he decided that this was the end for him, because he had heard tell of what happened to most of the Salmon he had arrived with. He overheard it from the fisherman on the boat he’d been captured, but chose not to believe it until he listened to a conversation, through the glass wall between himself and the butchers in the market. 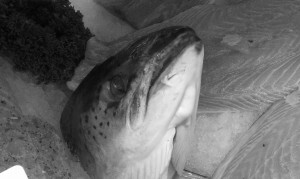 The word was out that they would be taken away and exploited in the fish market as they froze their fins off waiting to be purchased by one of the big supermarket chains. From there they would be cut up and sold to the highest bidder. Yes that wasLeon’s fear and on a cold November morning at the pier it became reality and it was the end for him. Because, after all, he was really and always would be part of the food chain. This entry was posted on Friday, July 20th, 2012 at 5:05 pm	and is filed under F. Ulanoff, Fay Ulanoff, Writer & Puppeteer, Flash fiction by F. Ulanoff, Uncategorized. You can follow any responses to this entry through the RSS 2.0 feed. You can leave a response, or trackback from your own site. A very poignant point about how other living creatures suffer. You make me feel for this fish. I felt for him too. That's how I was able to personify Leon into the fictional character he turned out to be. I love writing flash fiction. I knew Leon Fishbone would be of interest to anyone who cared to read his story.